One of the more charming aspects of Wednesday&apos;s ACLI Capital Challenge were, um, how do we say this? The bathrooms. 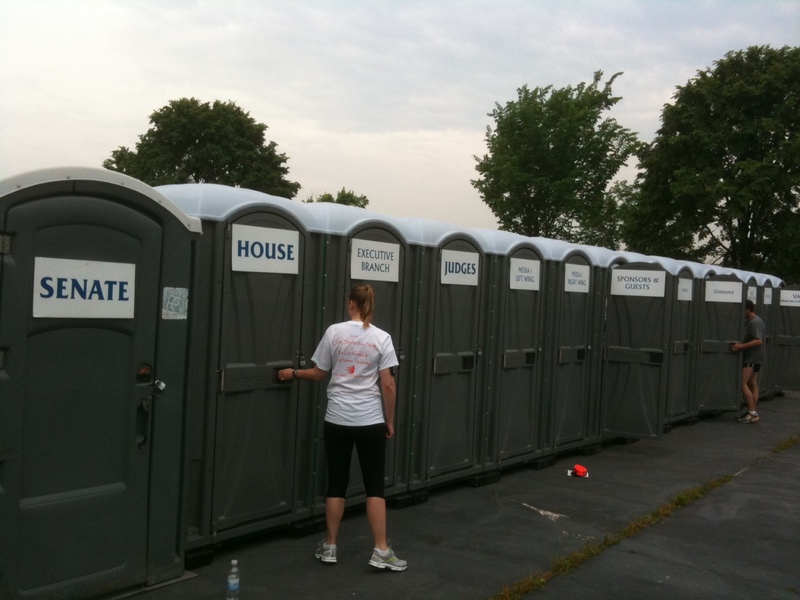 Every race has its porta-johns set up for runners seeking last-minute relief before the starting gun. This 3-miler, though, had some fun with it, labeling each receptacle in a tongue-in-uhh-cheek manner: Senate, House, Media/Left Wing, Media/Right Wing, VA (please move to back of line) and much more. And, of course, someone waited for his designated portable bathroom. Sen. Charles E. Grassley, R-Iowa, a dedicated runner and long-time ACLI Capital Challenge competitor, waited in front of the "Senate" john. When a young woman came out of an adjoining one, she offered it to him. He declined, preferring to wait for the Senators Only rest room. Patrick Fernandez of Team Coast Guard took the 1st Male Overall category with a 14:59 time. Erin Taylor of Human "Capitol" Running Club GSA took the 1st Female Overall category with a 17:43 time. Sen. Rob Portman, R-Ohio, was the fastest male senator, with a time of 25:04. Sen. Kay Hagan, D-N.C., was the fastest female senator with a 35:15 time. Rep. Tom Cotton, R-Ark., was the fastest male House member, with a time of 18:29. Rep. Kyrsten Sinema, D-Ariz., was the fastest House female with a 25:05 time. For full results, see the Capital Challenge website .